After walking in the mountains of Sao Antao/Cape Verde you can find this special swimming pool, our trained guide will bring you to this refreshing pool. 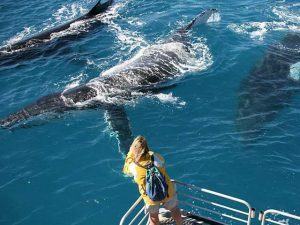 If you want more information about the tours you can make ask us for more possibilities, if you are in the right season it is possible to make a boattrip to see whales. We only work with official guides aproved by government. Walking holidays on Santo Antão mainly centre on well organised trails around the colonial town of Ribiera Grande, where local guides take treks through the breathtaking scenery that includes desert, tropical valleys, terraced fields, sugar, coffee and banana plantations, rugged coastlines and striking mountain ridges rising to nearly 5000 feet. For those adventurers who would rather walk alone, there are a number of detailed hiking tracks which are numbered and correspond to a guide-book that is available online, see our page trekkinn.